SARATOGA SPRINGS, New York–Equestricon, a horse racing convention, fan festival and trade show, will be held in Saratoga Springs next Aug. 13-15, it was announced Friday at a press in front of the Saratoga Springs City Center. The event, which will be held in the City Center, will feature a variety of attractions including panels and Q&As designed specifically for two-way interaction between speakers and attendees; product showcases and exhibitions highlighting both racing-related companies and Saratoga-based businesses; live music; a horse racing arcade; a fashion showcase; and meet-and-greets and autograph signings with past and current racing stars. 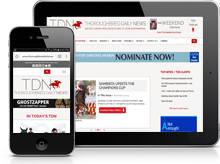 Equestricon is being spearheaded by Dan Tordjman, a correspondent for America’s Best Racing; and owner/breeders Kathryn Sharp and Justin Nicholson, founders of the Ninety North Racing partnership group. Tordjman also noted that event will emphasize a commitment to Thoroughbred aftercare–the Thoroughbred Aftercare Alliance is Equestricon’s official charity partner. Saratoga Springs Mayor Joanne Yepsen was also on hand for the announcement, and stressed the important relationship between the racing industry and her town. The Equestricon organizers have enlisted a diverse group of industry participants to serve on an advisory board. West Point Thoroughbreds’ Terry Finley and trainer Graham Motion, members of the board, both spoke Friday. Tordjman noted that the beginning of Equestricon coincides with the final day of Fasig-Tipton’s New York-bred Preferred Yearling Sale, and said talks have begun to coordinate the event with both the sales company and the New York Racing Association. More details about the event will be posted as they become available on http://www.equestricon.org/.